Pulsar is a patterning sculpture with strong visual effects. The two large wheels rotate rapidly in opposite directions. 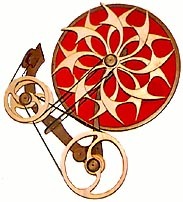 The wheels are weighted so that their rotational speeds vary with each revolution. This creates a constantly changing and pulsing pattern of motion. The patterning wheels are backed by a fabric color panel. This enhances the vivid optical effects. Although this sculpture uses the same type of mechanism as my older sculpture Meander, the running time is somewhat shorter because the wheels rotate faster.